The spoof English heavy metal band is the brainchild of American actors Michael McKean, Harry Shearer and Christopher Guest. They first featured in the classic 1984 "mockumentary" This Is Spinal Tap and went on to record two albums. Shearer, who these days voices several Simpsons characters, told BBC 5 Live: "It'll be for download as well as on conventional media later this year." Spinal Tap recorded their last album, Break Like The Wind, in 1992. The band briefly reformed two years ago for the Live Earth gig at Wembley Stadium in London. 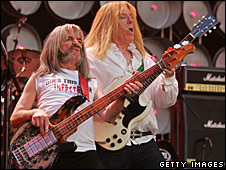 Shearer, who portrays Tap's bass player Derek Smalls said: "We've never recorded the song we did at Live Earth, Warmer Than Hell, and I think they (Spinal Tap) are trying to revisit their old success. "Not that they were ever popular, maybe in their own universe. "We'll do a song called Gimme Some More Money, probably with some dubious results."